You saw the real light of the sun, you breathed the air of the country, you felt all the circumstances of a luxurious climate on the most serene and beautiful landscape; and, the mind thus softened, you almost fancied you heard Italian music in the air (T.N. Talfourd, “Memoir” to Gaston de Blondeville, 65). This particular painting provided sensory experiences that made Radcliffe feel she was truly present in the landscape; this feeling of immersion is the one she often sought to replicate in her writing. Emily, often as she travelled among the clouds, watched in silent awe their billowy surges below; sometimes, wholly closing upon the scene, they appeared like a world of chaos, and, at others, spreading thinly, they opened and admitted partial catches of the landscape — the torrent, whose astounding roar had never failed, tumbling down the rocky chasm, huge cliffs white with snow, or the dark summits of the pine forests, that stretched mid-way down the mountains (Volume II, 164). Radcliffe describes the sight and sound of the snowy mountains to immerse readers in the setting; as a result, a place they are unlikely ever to have seen, can now be “seen” through her writing. 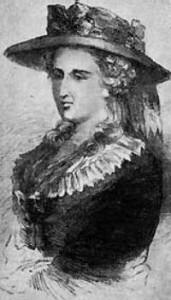 Like Charlotte Smith before her, Radcliffe sought to balance the imaginative Gothic elements of her novels with logic and rationality. Some authors emphasized the horror aspects of the Gothic genre, aiming to shock readers with gruesome deaths in dark atmospheres. Radcliffe, however, chose to emphasize dark moods and suspense in her novels. Her use of Gothic imagery never crossed the line into the macabre, as she preferred to leave much to the reader’s imagination. Radcliffe’s forests and dark castles are not landscapes in which ghosts lurk, but they are mysterious backdrops that set the mood of the novel. Gloomy atmospheres that are often difficult to escape are used to parallel the many social troubles of her protagonists. For example, a young woman held captive in an old mansion may also be facing an impending marriage to a cruel man. Her characters explore new lands and secret passages, and encounter what they perceive to be supernatural beings; but, however dangerous the natural world appears, all uncertainty is explained in the end. This suspenseful build-up leading to a resolution earned Radcliffe the name of the “Great Enchantress.” Radcliffe’s sense of morality kept her villains from becoming too evil or too brutal towards her protagonists. These multi-faceted villains contributed to the creation of an emerging character type, the Byronic hero: the dark, brooding, isolated figure who carries with him a strong sense of guilt, or shame, or both. Radcliffe led a private life, writing in her home for pleasure while her husband worked. Biographical information about her remains sparse and difficult to find, but her writing reveals much about her literary and intellectual influences. She was a lover of art and music, and familiar with Edmund Burke, a philosopher who believed that beautiful art could maintain its beauty even when it elicited a degree of horror. She was well-read in Gothic and Romantic novels of her time, and drew on images and ideas from Horace Walpole’s The Castle of Otranto and Clara Reeve’s The Old English Baron. With every novel she published, Radcliffe became more and more of a mystery, and various rumors about her continuously circulated. Some said she was mad, assuming only a madwoman could conceive the ideas found in her novels. Others were repeatedly reporting that she had died; this claim was difficult to prove or disprove, considering her love of privacy. She ceased publishing twenty six years before her death, spawning a wide range of explanations for her sudden disappearance from the literary world. Various imitators released novels that were assumed to be by her, but could not be, as the final book she published during her lifetime appeared in 1797. Radcliffe’s work influenced several writers such as Sir Walter Scott, Edgar Allan Poe, the Brontë sisters, and The Marquis de Sade. The Mysteries of Udolpho is considered an essential Gothic novel, as it popularized various Gothic tropes such as the terrorized heroine, the dark castle, mysterious incidents that appear to be supernatural, a calculating male villain, labyrinth-like dungeons, and stormy nights. Elements of her style were also praised and parodied in Jane Austen’s Northanger Abbey. Radcliffe’s ability to find the supernatural within the natural world resulted in a new type of Gothic Romance: one of forests, castles, strange happenings, and ill omens, but also one of logical explanations and satisfying endings.